Cape Town is the first African city, and one of seven progressive cities in the world, to officially endorse a Meat-free Day a week for the sake of animal welfare, human health and climate change. The City’s Health Committee unanimously backed a call by the Compassion in World Farming organisation for Capetonians to pick one day of the week where they eliminate red meat from their diet and eat more fruit, vegetables and grains instead. At a function to promote the campaign on 29 July 2010, the Executive Mayor of Cape Town, Alderman Dan Plato spoke of his initial surprise to the idea, as South Africans are known to love their ‘braaivleis’ (himself included!). On his doctor’s advice, he said, he currently enjoys two red meat-free days a week with his family and is healthier for it. Meat-free days are supported by other countries, where it is recognised that excessive meat consumption can be linked to cancer, heart disease and diabetes. Factory farming is responsible for 18% of the greenhouse gases that cause global warming (more than all the world’s cars), giving increasing numbers of people who are committed to mitigating the effects of climate change the motivation to cut meat out of their diets entirely. Beef farming is intensely energy intensive, as is demonstrated by the fact that it takes the equivalent of a seven-minute shower each day over six months to produce just 500 grams of beef. To learn more about the links between food and climate change have a look at the Smart Eating Booklet developed by icologie for the City of Cape Town. 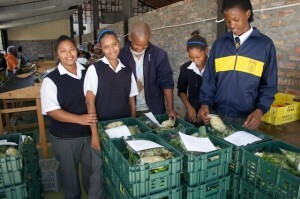 We support organisations such as Harvest of Hope and Kwalapa that promote local, seasonal and organic vegetables!